It is our goal to make your carp fishing holiday unforgettable! 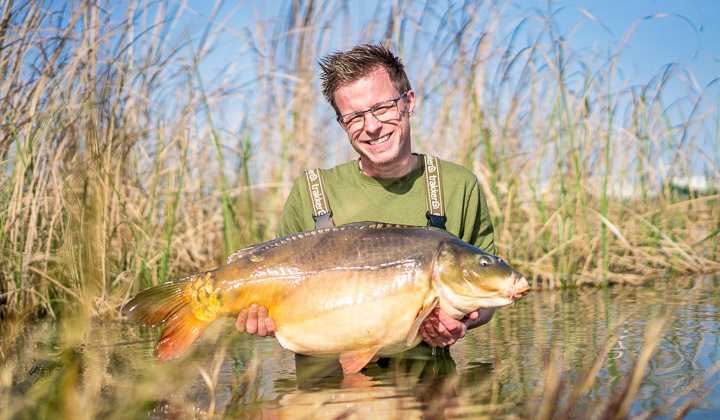 Since 2004, The Carp Specialist has grown to become one of the biggest suppliers of quality carp fishing holidays in France, Belgium, Hungary, Morocco and The Netherlands. As carp angler with the knowledge of the French language and experience in the hospitality, we know how to make a carp fishing holiday special! A high quality of over 50 lakes, personal contact with our guests and a professional approach is our goal from day one. In the following years, The Carp Specialist has evolved into a serious travel company that welcomes thousands of carp anglers every year on our carp fishing venues. Although the volume has increased, the personal approach is retained. Since 2018, Mark is our English agent and will do anything for you to make your carp fishing holiday a success. So don't wait too long if you have any questions and feel free to contact us by phone, WhatsApp or email at any time! Do you like to meet us in person? No problem at all, just hop by in January at the Brentwood Carp Show or later that year at the Big One Show in March! The Carp Specialist: By carp anglers, for carp anglers! Our fulltime team exists out three people. Mark de Zwart (travel agent for our English guests) Bas van Klaveren (travel agent for all our Dutch & Belgium guests) and Jeroen Albers (travel agent for all our German guests). To get a clear overview of our range of carp fishing lakes we offer, we have subdivided them into various categories: Many anglers, many different venues. So you've come to the right place regardless of the type of carp fishing holiday you're looking for: basic or luxurious, easy or difficult, beautiful in nature, a short trip abroad or the real big fish hunt? You can find it with us! The Carp Specialist: your trusted and professional partner! As you would expect from a professional travel agency, The Carp Specialist has a fully automated back-office so that human errors are minimised. It is a priority to keep the availability of our agendas and on our website entirely accurate. Also financial we make sure your holiday is 100% correct. The Carp Specialist do not use booking costs or 'hidden' costs onsite... all expenses that you can expect are mentioned on our website and under the header 'Prices' at the venue page. Your payments are also in safe hands with us: we meet all administrative requirements that apply in the field of travel agencies and are assisted by an accountant. So nothing to worry about! If you need any help with your carp fishing holiday, don't hesitate and contact us for further information! Mark is extremely friendly and helpful and has been giving us tips and info to try to make our trip as good as possible would highly recommend using The Carp Specialist we will certainly be using again next time!! You can request a printed brochure and it will be dispatched to you by post. Subscribe to our newsletter and receive tips, tricks and the latest news of The Carp Specialist in your mailbox. Discover all the carp lakes that we've selected.